the faucets running like a cautionary tale. 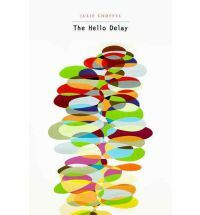 Julie Choffel’s The Hello Delay reads very much like “a cautionary tale” for our current age, one that both warns against and seeks out the anxiety that comes with living in the year 2012. Choffel seems to be looking for the words to express the ineffable, a way to make sense of chaos through language. We are left wondering how language can possibly succeed in communicating anything at all—and what a strange question to be asked in the midst of a collection built out of words. The Hello Delay begins with a kind of offering to the reader: “Here, from a fake rose / I’ve made you a real one” (“Serenade, or After Others”). We are offered a gift, as it were, one that requires us to suspend our understanding of the real while inside the world of the collection. In this first small poem, Choffel provides the reader with a lesson in reading the poems to follow, an explanation that the notions of real vs. unreal will be shifted and broken down and complicated in The Hello Delay. The central image of the collection is the “modern phone call between / meals” (“Table—Chair—Toy”), the anxiety-producing phone call in which one waits, breathlessly, in the delay between saying hello and a reply—that familiar moment of anticipation. Choffel is gesturing with this image towards the collective, and asks herself and the reader: what can be said of this feeling? The answer is a double-edged sword. She must express the limits of language using the very same language. For Choffel, the insufficiency of words is all encompassing. Translation, Choffel appears to conclude, is a failed enterprise, despite how much one might long for understanding, clarification and even enlightenment. Words, no matter their source language, remain elusive. The Hello Delay also expresses the frustration of language by playing with colloquial phrases, often turning them inside out so that the reader is forced to question the acceptance of this type of speech altogether. Phrases such as “all come-what-may” and “heltery-skeltery” from “Plant Life,” and “we will continue / this later” and “pretty please” from “The Sorrows” demonstrate Choffel’s manipulation of the common, even the domestic rules of speech that sound eerily out of place in these poems. These phrases suggest that even speech language, that type we use so thoughtlessly, is not innocent. For Choffel, all language seems to keep her in a prison of inexpressibility. In still other moments, Choffel takes on a clinical tone, as if giving the reader a set of instructions—but for what? “Please fill to the top./And until there is something else to say” (“Cardinal Sketch”), she insists, and “milk the tree for the time being” (“Menagerie—Scenery—Suburb”), and then “please dial slowly” (“Synopsis”). In these moments, the reader feels directed toward some action, but the purpose is unclear. The Hello Delay hinges around this message of “cautionary tales, incomplete phrasing” (“Table—Chair—Toy”). If language is a prison, than how is one to make sense of the world with only language as a means of expression? Choffel wants to warn us about being too complicit with the everyday language. There are “so many ways of not knowing what / there is not a word, knowing what words it isn’t, yet / selected like everything in brevity” (“The Debriefing”). We must be careful; we must choose our words thoughtfully. But even so, “memory fails the important phrases” (“Plant Life”) sometimes, so that even with care and awareness, we cannot rely on our memory to find the right word or even our language to supply one. Language fails us at every turn. One might refer to this collection as a “syntactical defense” (“This World is the Other World”) against words that uses language as a weapon against itself. The only escape from this prison that the The Hello Delay appears to foster is an escape through sound “as natural as nature” (“If Anything). It is difficult to conceive of a world in which language is used to examine the flaws in itself, and yet Choffel has done that in The Hello Delay. There will always be the world, but how can we express what we see? What words will ever be adequate enough? it’s the first thing, and the finicky noticing. The away. It keeps it up. There, there—spread of land is mouth and eye. I want to describe it for you. “I want to describe it for you,” she concludes, but of course, The Hello Delay has taught us such an act is impossible. We can only approximate experience. And Julie Choffel approximates her experience very well.